As the documentary shows, even Shakespeare never devised a plot as shadowy as the one that engulfed the trio. It’s about as human and interesting as stories get: Three men meet for the first time, and discover they are identical triplets separated at birth. Reunited by chance in 1980, the three teenage siblings — Edward Galland of New Hyde Park, David Kellman of Howard Beach and Robert Shafran of Scarsdale — found they shared not only physical attributes but mannerisms, habits, likes and dislikes. Their heartwarming story and head-spinning similarities turned them into media darlings: They popped up on television talk-shows, appeared in a movie with Madonna and used their fame to open a Manhattan eatery called Triplets. 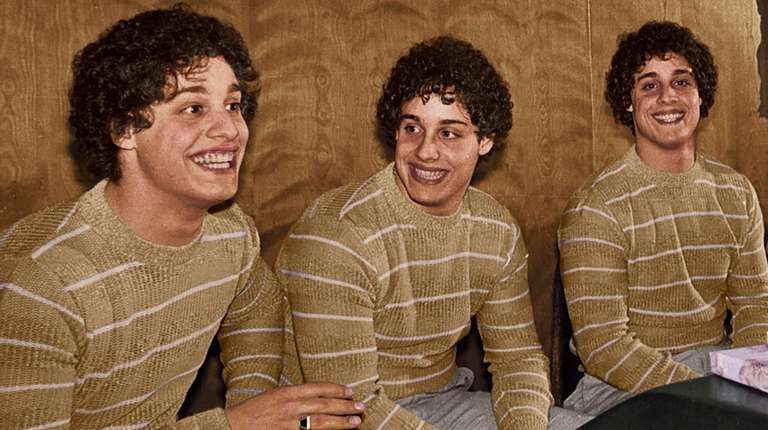 The first feature documentary on the triplets, Tim Wardle’s “Three Identical Strangers,” tells a different story than what the public saw in 1980. It wasn’t until 15 years later that the triplets — born at what was then Long Island Jewish Hospital (now Long Island Jewish Medical Center) in New Hyde Park — learned they had been part of a clandestine behavioral study conducted by a prominent psychiatrist with the help of a now-defunct adoption agency, Louise Wise Services. Around the same time as that discovery, one of the triplets killed himself. “Three Identical Strangers,” due in theaters June 29 (it opens on Long Island on July 6), could be called a real-life version of “The Truman Show,” in which three men realize their lives have been closely monitored by outside forces. The improbable chain of events began when 19-year-old Shafran enrolled at Sullivan County Community College, about two hours west of his Scarsdale home. Having recently pleaded guilty to manslaughter in connection with a beating death during a robbery — he was sentenced to probation and community service — Shafran was looking to start a new life. Instead, many of the college students already seemed to know him. Men slapped him on the shoulder in greeting. Women hugged and kissed him. Everyone called him “Eddy.” One woman insisted they’d dated, and even knew the location of a birthmark on his body. After two days of confusion, it was a fellow from Baldwin named Michael Domnitz who thought to ask Shafran his birth date (July 12, 1961) and whether he was adopted (the answer was yes). The two then drove at top speed to a house in New Hyde Park, where the door opened to reveal Shafran’s mirror image, Eddy Galland. “Oh, my God,” the siblings said. They exchanged hugs, went inside and began trading life stories. They found they were natural raconteurs and joke-tellers who liked Southern rock, Italian food and older women. Both were sexually precocious; they'd lost their virginity at age 12. They wrestled in high school (each clocked his fastest victory at 18 seconds) and now felt they smoked too much. They were also problem students who had been told by therapists that their problems were rooted in adoption. Even Shakespeare, though, never devised a plot as shadowy as the one that engulfed the triplets. In the mid-1990s, the triplets received calls from The New Yorker journalist Lawrence Wright, who was working on a story about twin studies. What the triplets learned came as a shock: Their adoption agency, Louise Wise Services, had been working with a child psychiatrist, Dr. Peter Neubauer, who had launched his own study. Essentially, Louise Wise was supplying Neubauer with test subjects — not just the triplets, but also about a dozen pairs of identical twins — who could be given to different families and monitored. None of the triplets’ adoptive parents were told their son had siblings, and researchers paid regular visits to each family. In the early 1960s, splitting up siblings and hiding their biological information wasn’t necessarily considered unethical, according to Faith Getz Rousso, an adoption attorney in Garden City. Rousso, herself a product of the Louise Wise system, has followed the triplets’ story with interest over the years. “At the time, the emphasis was on protecting the adoptive family,” she says. “They were always afraid the birth mother would come back and take the baby.” As a result, adoptive parents and children alike were often told nothing about genetic conditions, histories of mental illness and other important factors. “It never occurred to them that it would be in the best interest of the child to know something about their past,” Rousso says. In 1995, Galland killed himself after several episodes of what seemed like manic-depressive behavior, leaving the surviving brothers to wonder: Was the trauma of their early separation partly to blame? Shafran and Kellman had both been headbangers as babies; all three boys had had troubled teenage years. Film shines new light on triplets separated at birthThree Long Island brothers, identical triplets separated at birth, rediscover each other at age 19. Their amazing similarities and joy in finding one another make them a good-news sensation.